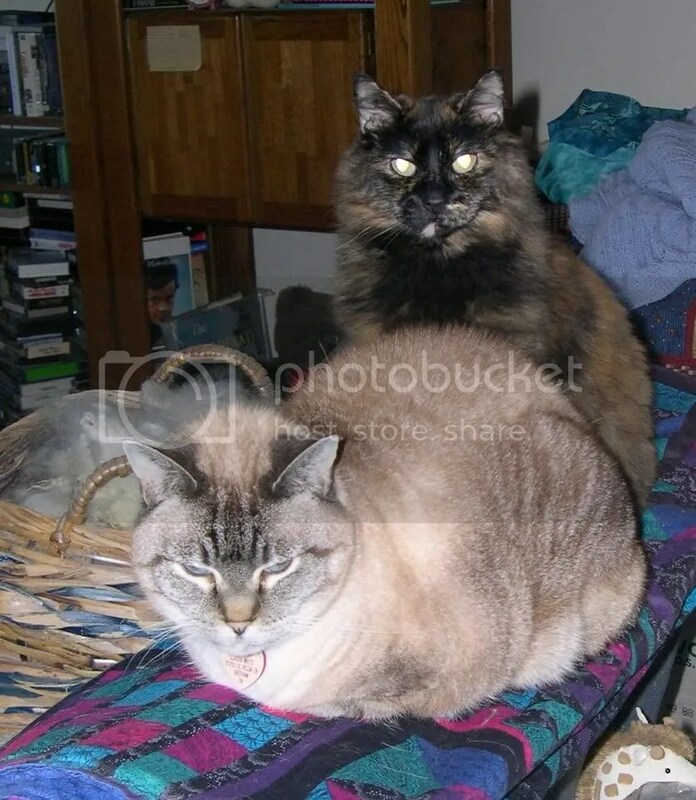 Before I continue Da Mystery Road Trip, I wanted to post a few more photos of my beloved pōpoki, Xannie and Makanani. 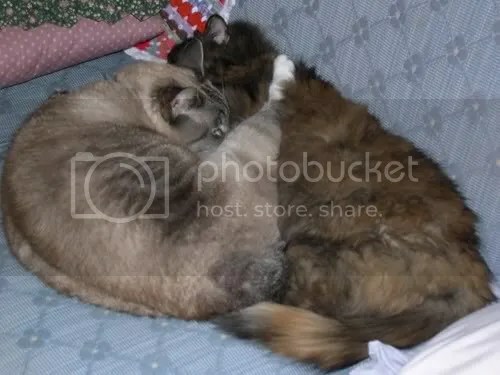 I got Xannie (Xanax) as a kitten; my friend Linda knew I loved calico-y cats and her Momcat had just had a litter of kittens, and she asked if I wanted one of them. Definitely! My daughter Leilani and I went over to Linda’s house and picked out the one I wanted, but we left her there to grow up for a few more weeks. The cats lived outside and were real barn cats, so by the time I got Xannie, she was pretty wild. Amazingly, she calmed down really quickly, and soon became the ruler of our house. Dinnertime was anytime she decided it was! She decided who could sit where, whose lap she’d deign to lie on, and when it was time for bed. 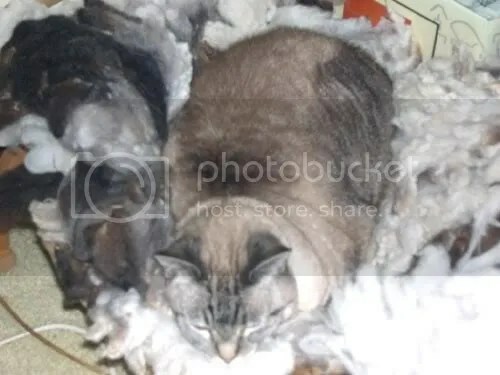 Her fur was soft as could be (she was part Persian), and she loved to be brushed. When she decided it was time for brushing, that is. We got Makanani about a year later from another friend; I named her Makanani because of her beautiful blue eyes, but Leilani and Anela always called her Lint because they said she looked like a big dust bunny. She was very shy and skittish and ran and hid whenever anyone came into the house. I was the only person she bonded to for some reason; she’d cuddle with me when Xannie said she could. Sometimes Makanani would sleep apart from Xannie (with permission), but mostly they were always together. Here she is, asleep on some Jacob fleece in a basket that I am going to spin one of these days. I loved Makanani’s “raccoon tail”, black with stripes. Her voice could be extremely strident, especially when she was hungry. And oh, how persistent she was about getting fed quickly! Sometimes her yowls would drive me crazy (she had that “Siamese voice”). I called her “my talking pōpoki”, because she’d really talk to me. Yes, really. I’d call her name and she’d make her Makanani sounds as we conversed. Makanani and Xannie were best friends. They’d sleep together, curl up together, and eat together. 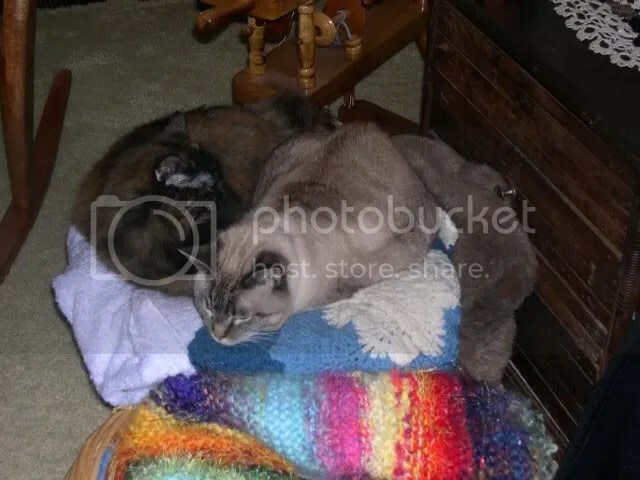 Makanani’s favorite place to sleep was ontop of these two blankets that I’m crocheting and knitting. She shed terribly. Need I say more? 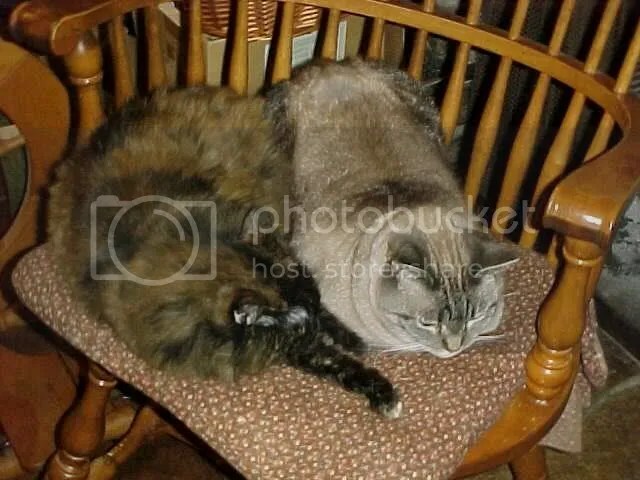 Sometimes they’d sleep on the dining room chair together. And sometimes they’d be on the back of the couch. Makanani was never the same after Xannie died. She’d wander the hallway, crying desolately for her friend who was no longer there. I gave her extra attention; she became much more cuddly, lying ontop of me when I’d lie down on the couch and trying to curl up with Kukui. But it just wasn’t the same, and she slowly began to go downhill. I miss both of them so much. I miss having a “Two Cat Nap” with both of them lying on me at the same time. Even now, my eyes fill with tears writing about them. There is a big puka in my heart because they’re gone. 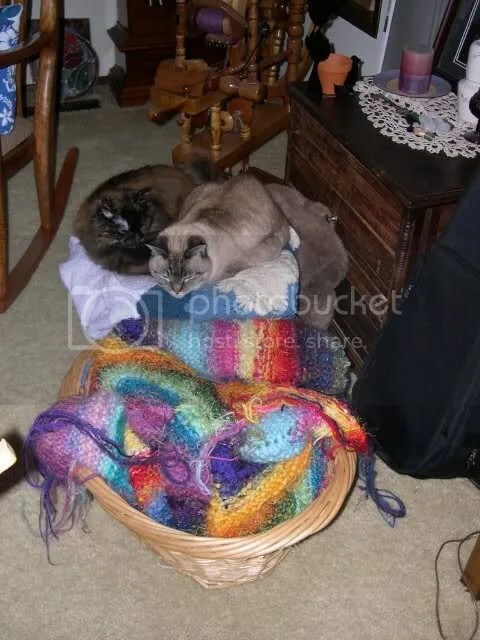 I’m glad I have the photos, glad I got to spend sixteen years with both of them. They filled my life with joy and accepted me for who I am. Kitty Yin Yang, my friend Kamaka called them. Now they are together again… I am glad for them, sad for me. Mahalo Moki fo’ sharing yowah close ones wit us. Jush remembah u gave dem a good life Moki. Deh always goin’ be wit u. They are so beautiful! Thank you for sharing such beauties. Than you so much for sharing them with us. They are wonderful. I think somehow they still exist somewhere.